All new Sonnet Products purchased on or after January 1, 2019, have a Two Year Limited Warranty, except as listed here. All new Sonnet Products purchased on or before December 31, 2018, have a One Year Limited Warranty, except as listed here. 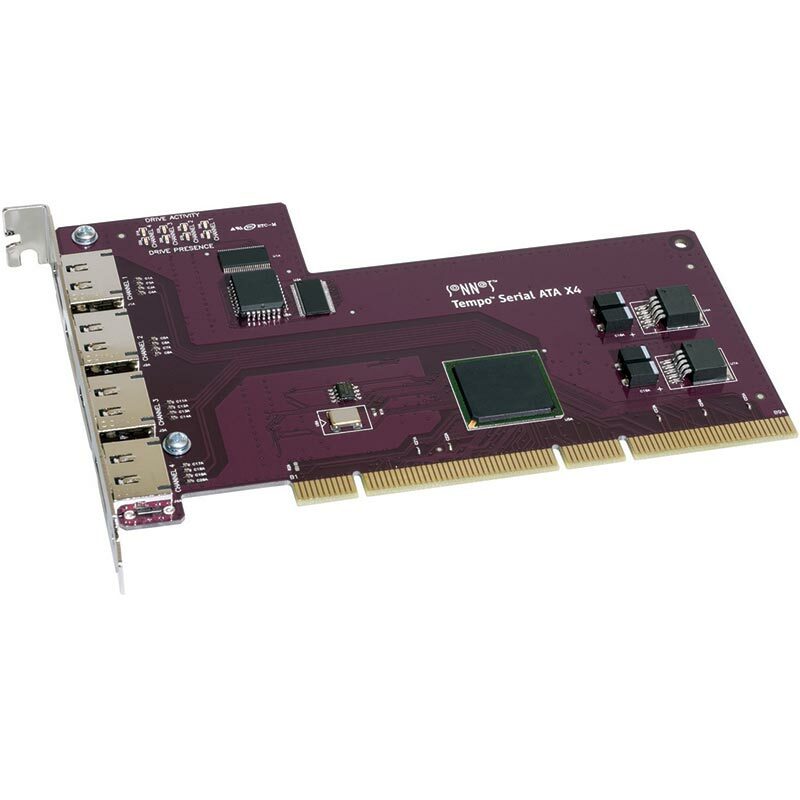 Tempo SATA X4P was designed with high definition video work in mind—its PCI-X interface offers huge bandwidth for sustained data throughput, so the card never slows you down. It also offers unprecedented storage expandability—its support for high-performance multi-drive storage systems with port multipliers or hardware RAID controllers enable it to handle up to twenty hard drives at the same time! Port multipliers and hardware RAID controllers manage the data flow of up to five drives in one enclosure, transferring files between your computer and drives through a single locking cable. Connect four storage systems, and using today's highest-capacity drives, you can access an astounding 60 Terabytes of storage. For maximum performance, you can create a single, large RAID 0 set across multiple drives in two or more enclosures to capture and process uncompressed high definition video, or conquer other high-bandwidth applications. You can just as easily create smaller RAID sets to work with multiple streams of compressed video. For fantastic flexibility, you can work with 20 drives individually and hot-swap them out as needed. You can even work with a combination of RAID sets and individual drives—your choices aren't limited. When your storage needs have outgrown standard solutions, get a Tempo SATA X4P—it'll give you room to grow and blazing performance for the most demanding applications.